Finding a solution to the feeling of isolation that can come with being a small business owner was the challenge that Phil Medina, President and owner of KeyCom Technologies, needed to pursue. It was within the Florida SBDC at UCF (FSBDC at UCF) and its CEO XChange program that he found the answers and support he had been seeking. CEO XChange is an executive roundtable program that offers a confidential setting for business leaders to discuss vital issues, opportunities and trends with a group of peers. KeyCom Technologies is a full-service design, installation, and support organization for a wide spectrum of technologies tied to carrier services, phone systems, access control, surveillance, data networks, Wi-Fi, and infrastructure utilizing fiber optics in the ground and data cables in the walls. They have been particularly strong outfitting assisted living facilities, schools, and auto dealerships, but have worked in almost all environments. At the helm of a 35 year old, fast-moving technology firm having served 5,000+ business customers, Medina has a lot on his plate. 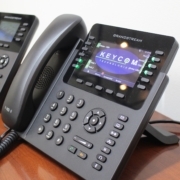 For information about KeyCom Technologies, please visit www.keycom.net. Hosted by the University of Central Florida (UCF), and with its main office in the National Entrepreneur Center located at the Fashion Square Mall in Orlando, the Florida SBDC at the University of Central Florida (FSBDC at UCF) is part of the UCF Office of Partnership & Innovation and the Florida SBDC Network. The Florida SBDC at UCF provides aspiring and existing small businesses with no-cost consulting, low-cost training, and access to business data and research resources. In addition to its core service offering, the Florida SBDC at UCF also offers specialized services to qualifying companies, including capital access, market growth, government contracting, international trade, business continuation, cybersecurity, disaster planning and recovery, and more. The FSBDC at UCF serves an eight-county area that includes Brevard, Flagler, Lake, Orange, Osceola, Seminole, Sumter, and Volusia counties and maintains 10 service centers across Central Florida. In 2017, the FSBDC at UCF served over 2,450 entrepreneurs in Central Florida with consulting services, resulting in more than 5,600 jobs created, retained or saved; $623 million in sales growth; $23 million in capital formation; $32 million in government contract awards; and 71 new businesses started. For over forty years, the Florida SBDC Network, the state’s principal provider of business assistance [Fl. Stat. 288.001], has nourished a statewide partnership between higher education and economic development to provide existing and emerging small and medium-sized business owners with management and knowledge resources that enable overall growth, increased profitability, and economic prosperity for Florida’s economy. In 2017, Florida SBDCs have provided professional business consulting to 11,750 client businesses, resulting in more than 28,800 jobs impacted; $3.2 billion in sales generated; $145.6 million in government contracts acquired; $135.4 million in capital accessed; and 335 new businesses started. A statewide network of over 40 offices, the Florida SBDC is funded in part by the U.S. Small Business Administration, Defense Logistics Agency, State of Florida and other private and public partners. The Florida SBDC Network, headquartered at the University of West Florida, is nationally accredited by the Association of SBDCs and is a 2016 recipient of the President’s E Award for Export Service. Florida SBDC services are extended to the public on a nondiscriminatory basis. Language assistance services are available for individuals with limited English proficiency. For more information, please visit www.FloridaSBDC.org. Orlando, FL – “You don’t know what you don’t know.” That’s the mantra of many of the smart and successful small business clients that seek assistance from Florida SBDC at the University of Central Florida (FSBDC at UCF). And all credit goes to those business owners; recognizing that they don’t have all the answers and that they can benefit from the FSBDC’s services, including its programs for established, second stage companies as well as its expert, confidential, no-cost consulting. 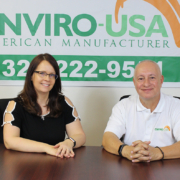 Jennifer Vargas, President, and Luis Vargas, Vice President, lead and are co-owners of Enviro-USA American Manufacturer LLC, the producer of environmental protection apparatus. It makes containment booms for the oil industry, silt or turbidity curtains for the marine construction industry, and seaweed barriers for the tourism industry. They had grown the business to more than $1 million in sales by 2016 but had hit a rough patch. Enviro-USA and the Vargases accessed multiple of the FSBDC’s services. 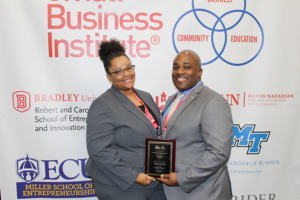 They received in-depth marketing and financial analysis consulting from the FSBDC’s Eastern Florida State College sub-center. 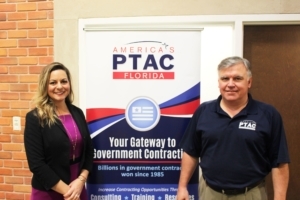 The local Procurement Specialist from the FSBDC’s Florida Procurement Technical Assistance Center at UCF (Florida PTAC at UCF) assisted with government contracting opportunities. And the FSBDC at UCF’s International Trade Program Manager Jill McLaughlin led in developing an export marketing plan for the company. If that wasn’t enough, the Vargases also joined the FSBDC’s Advisory Board Council (ABC), a no-cost board of volunteer experts, selected to address the specific needs of the FSBDC client providing advice and counsel to help businesses grow. “Working with the ABC advisors was so important and so valuable. They shared so much knowledge; about production, sales, human resources, business-to-business marketing. It enabled us to make so many better decisions at the company. And ABC Program Manager Jill Kaufman was instrumental in making it happen,” stated Luis Vargas. The Vargas’s work with the FSBDC has paid rich rewards. Enviro-USA has achieved remarkable results since starting with the FSBDC: the company has been able to double its factory space, its work force and its manufacturing capacity. Revenues have increased more than 90% and profits have grown by 1,000%. For information about Enviro-USA American Manufacturer please visit www.enviro-usa.com. Orlando, FL – The intersection of creativity and commerce can be hard to find for entrepreneurs and small business owners. Transforming an idea into a business, then imbuing that idea with the passion and desire of an artist, takes energy and resilience and courage. Professional artist Lynne Schaffer had those qualities and more when she came to the Florida SBDC at the University of Central Florida (FSBDC at UCF) for assistance with launching and building her art, makeup and fashion brand, the House of PurgARTory, beginning with PurgARTory Makeup by Lynne Schaffer. From its start more than a year ago, PurgARTory Makeup by Lynne Schaffer has grown into a successful business. Schaffer is collaborating with others in the arts community, scheduling special makeup events at boutiques and hair salons, and was featured at a fashion show in a prominent local art gallery. She is producing “Pop Up” shops where she works directly with clients introducing the advantages of PurgARTory Makeup by Lynne Schaffer. For information about PurgARTory Makeup, please visit www.purgartory.com. Orlando, FL — The Florida Small Business Development Center (SBDC) at the University of Central Florida (FSBDC at UCF) will celebrate the third annual SBDC Day Wednesday, March 20, 2019. SBDC Day is a national movement to celebrate the success and impact of America’s SBDCs, the U.S. Small Business Administration’s (SBA) largest business assistance program. With an SBDC in every U.S. state and territory, and more than 1,000 centers across the country, SBDCs provide assistance to hundreds of thousands of aspiring and existing small businesses each year. SBDCs help entrepreneurs realize the dream of business ownership and help existing businesses remain competitive in a complex, ever-changing global marketplace. In 2017, America’s SBDC clients experienced annual sales growth of 18.1 percent, almost 4.5 times more than the national average. SBDC assistance resulted in 93,471 jobs created; $7 billion in sales growth; $5.9 billion in capital investments; and 14,716 new businesses started. “SBDC clients give their SBDCs 4.5 out of 5 stars and 92 percent of SBDC clients recommend their SBDC to other small businesses. With nearly 40 years of expertise, proven ROI and stellar client ratings, it’s clear that America’s SBDCs are the nation’s most trusted small business resource,” said Charles “Tee” Rowe, president and CEO of America’s SBDC. The Florida SBDC at UCF is a member of the Florida SBDC Network, the state’s principal provider of small business assistance. The network has more than 40 centers from Pensacola to Key West hosted by the state’s leading universities, colleges, and economic development organizations. To learn more about SBDC Day, and to join the celebration, please visit http://floridasbdc.org/national-sbdc-day. Orlando, FL – Resolve. If there’s one trait that distinguishes successful entrepreneurs and their small businesses from the rest, it is their determination to accomplish their goals, undeterred by the obstacles they must overcome. Ashley Green, the founder and principal at Patriot Government Partners, a business specializing in government contracting, has proven she has the necessary tenacity and, when assisted by the Florida Procurement Technical Assistance Center at the University of Central Florida (Florida PTAC at UCF), the needed support to be successful. 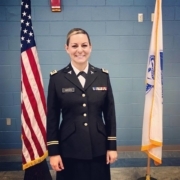 Ashley Green has served for almost 20 years, and is a newly promoted Major and Company Commander, in the United States Army Reserve. Patriot Government Partners launched in November 2018 with a mission to leverage the founder’s military background –– and her healthcare experience and knowledge of small business ownership to provide information technology and project management services, centered primarily around healthcare, to government contracting clients. Once Patriot Government Partners opened in November, with the help of the Florida PTAC at UCF Green registered her company as a woman-owned and veteran-owned business within the U.S. Government Services Administration’s (GSA) System for Award Management (SAM). She began watching the daily feed of opportunities from the Bid Match system. And she found one! But time was short. The Florida Air National Guard had put a contract for bid to project manage a Yellow Ribbon Reintegration Program event where airmen and their families are provided information and services prior to a deployment. It was scheduled for late January. Unfazed by the short time line, Green pursued the contract with assistance from the Florida PTAC at UCF. In just a few short weeks that included two major holidays and a partial government shutdown, and despite being new to government contacting, Green overcame delays, doubts and uncertainty, and Patriot Government Partners won their first contract three months after launching. If that’s not resolve in the face of long odds, then nothing is. For information about Patriot Government Partners, please visit www.patriotpartnersllc.com. Government Contracting Services offered by the Florida Procurement Technical Assistance Center (PTAC) at the University of Central Florida provide high-value, confidential one-on-one consulting at no cost to help Florida businesses prepare, research, and bid on federal, state, and local government contracts. Since 1986, Florida PTAC client businesses statewide have won $8.3 billion in contract awards, helping to create and save 187,090 jobs. This PTAC is funded in part through a cooperative agreement with the Defense Logistics Agency. For more information, please visit www.fptac.org. With its main office in the National Entrepreneur Center located at the Fashion Square Mall in Orlando, the Florida SBDC at the University of Central Florida (FSBDC at UCF) is part of the UCF Office of Research & Commercialization and the Florida SBDC Network. The FSBDC at UCF provides business seminars and no-cost, one-on-one business consultation to emerging and established businesses. The FSBDC at UCF serves an eight-county area that includes Brevard, Flagler, Lake, Orange, Osceola, Seminole, Sumter, and Volusia counties and maintains 10 service centers across Central Florida. In 2016, the FSBDC at UCF served over 2,400 entrepreneurs in Central Florida through consulting and training, resulting in nearly 6,700 jobs created, retained or saved; $980 million in sales growth; $92.7 million in capital formation; $154.6 million in government contract awards; and 120 new businesses started. Since 2011, Florida SBDCs have provided 513,107 hours of professional business consulting to 74,669 client businesses, resulting in 252,955 jobs created, retained, or saved; $33.3 billion in sales growth; $2.6 billion in government contract awarded; $1.4 billion in capital investments acquired; and 4,159 new businesses started. Orlando, FL – The Small Business Institute® (SBI®), the premier provider of professional development for those engaged in experiential student team consulting and related entrepreneurship education, research and activities and the link between business, education and community, recently announced that two (2) student teams from the University of Central Florida’s College of Business Administration (UCF CBA) were winners in its annual Project of the Year (POY) competition, taking 1st place in the 2019 ‘Graduate Specialized’ category and Honorable Mention in the 2019 ‘Graduate Consulting Project’ category, respectively. In competition with MBA teams from across the country, the UCF CBA team of students on the strength of their consulting project for a local company, CE Avionics of Sanford, FL. The company, a leader in avionics repair and installation, received the team’s assistance in the form of an in-depth marketing plan which provided full industry and competitive analyses and an implementation plan for penetrating a new market, including pricing and promotional strategies. The team of Shardeh Berry, Kasimu Greenidge and Hannah Gehring were awarded an Honorable Mention in the ‘Graduate Consulting Project’ category for their consulting work for Winter Springs, FL-based Tuskawilla Lawn Maintenance. The team’s report included an outlook of current industry conditions, in-depth financial analysis, and recommendations for improving the organization’s systems and processes. Both teams worked with faculty advisor Dr. Carl Blencke, an instructor for the UCF CBA’s Department of Management, as part of a management class. 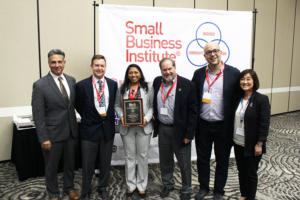 The Florida SBDC at UCF (FSBDC) sponsors the Small Business Institute® in Central Florida and, in conjunction with the Department of Management at the UCF College of Business Administration, manages the SBI® program locally. It recruits and evaluates FSBDC clients for the program, lends FSBDC consultants as SBI® case supervisors and provides a range of guidance and support. The FSBDC is part of the UCF Office of Partnership and Innovation. At the UCF College of Business Administration, SBI® is a graduate‐level elective course. Students enrolled in the class provide management consulting services to local small businesses. Each student team has direct contact with the client and produces a professional case report. The report is the ultimate product of the program and is tailored to each business. Case study reports have included market research, marketing plans, competitive analysis, advertising strategy, customer surveys, strategic plans, financial analysis, human resource manuals and business plans. The SBI® Program is offered as a full-semester credit course through the CBA’s Department of Management. During the semester, the student teams oversaw and implemented extensive research and analysis to determine industry best practices; met regularly to understand company processes and procedures; and performed wide-ranging analysis of business and industry strategies and performance. As a result of their efforts, the students were able to provide a comprehensive analysis and set of recommendations. SBI® is a nation‐wide program that provides high‐quality business assistance to companies in need while providing an extraordinary opportunity for university students to learn through field case studies. Each project is led and conducted by a group of students under the supervision of an SBI® Director or faculty member. The experience is often cited by students as being one of the most rewarding of their academic careers. In today’s collegiate environment there is a strong emphasis on experiential learning, and the SBI® has been at the forefront of this movement for over thirty years. Orlando, FL – People. It’s always about people. Finding good ones; then finding more. Helping them be as productive as possible. Creating a constructive company culture. Human resource management is one of the single largest challenges faced by owners of small-to-medium sized businesses. That’s what we see and hear at the Florida SBDC at the University of Central Florida (FSBDC at UCF) every day and why we offer the DISC behavior assessment tool, implemented by a DISC-trained consultant, to help our clients improve work productivity, teamwork and communication. Springer contacted FSBDC at UCF consultant and DISC expert Lisa Reineck to implement the DISC tool. Focused on four behavioral traits — Dominance, Influence, Steadiness, and Compliance – the tool draws a picture of an individual’s behaviors and preferences that can be used to enhance collaboration, cooperation and communications. 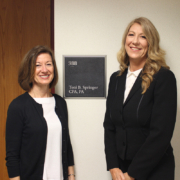 For information about Toni B. Springer CPA PA, please visit www.tbscpa.com. Orlando, FL – Going it alone is sometimes the curse of owning and running a small business. You have the idea and the passion and the drive but there are only so many hours in the day, and a small business person wears so many hats. Fortunately, the Florida SBDC at UCF (FSBDC at UCF) and its sub-center, the Florida SBDC at Daytona State College (FSBDC at DSC), are there to help. 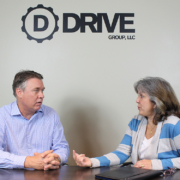 Bill Payne, owner and chief creative of Drive Group, found himself in just such a position early on in his company’s history. Drive Group is a branding and digital marketing agency in Ormond Beach, FL that gets results for its local and national clients by building websites that work as well as delivering top-of-the line SEO/SEM, messaging and branding. “Working with FSBDC has been fantastic,” says Payne today. “I can confidently say my business would not be where it is without them.” Taking advantage of their no-cost, expert business consulting, seminars and workshops, and now their market research services, Drive Group has thrived with the help of the FSBDC, led by consultant and FSBDC at DSC Assistant Director Maggie Incandela. In addition to benefiting from the consulting and other services of the FSBDC, Payne is a member of the FSBDC at DSC’s Growth XChange. Growth XChange is a facilitated, peer-to-peer coaching roundtable program where business owners engage in collaborative thinking and problem-solving, discussing vital business issues, opportunities and challenges with a goal of leading their companies to the second stage of growth. For information about Drive Group, please visit www.drivegroupllc.com. Orlando, FL – Hitting a bump in the road goes with the territory when you are a small business owner. The challenge for an entrepreneur is to know what to do when you hit that bump. 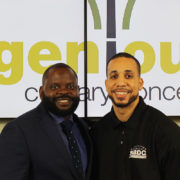 When Kern Halls, founder and chief innovator of Ingenious Culinary Concepts, encountered a slowdown in the growth of his company, he decided his best bet was to seek assistance from the Florida SBDC at the University of Central Florida (FSBDC at UCF). Ingenious Culinary Concepts (ICC) core business is helping Kindergarten through grade 12 school food service programs be successful, both in terms of satisfying their student customers and minimizing, if not eliminating, expenses for their school system. Saving children from hunger translates to them doing better academically. And, because school lunch programs rely heavily on federal funding, if they are underutilized and don’t make the most of the available federal dollars, then the excess costs fall on the local school district. Halls took advantage of the FSBDC’s no-cost, expert business consulting; seminars and workshops; and market research resources. Working with FSBDC consultant Jairo Batista, who provided a website analysis and social media recommendations, Halls redesigned his marketing strategy and increased its effectiveness. Thanks to Batista, he also consulted with Steve South, Procurement Specialist and manager of the Florida Procurement Technical Assistance Center (PTAC) at the University of Central Florida (PTAC at UCF), who assisted him with pursuing government business certifications as well as identifying government contracting opportunities. Kern Halls hit a bump in the road but he knew what to do; he got help in the form of assistance from the Florida SBDC and Florida PTAC at the University of Central Florida. For information about Ingenious Culinary Concepts, please visit www.ingeniouscc.com . Orlando, FL – Great ideas for successful businesses can come from unexpected places. Cynthia and Warren Billings were surprised when their dream home project caught the attention of a huge audience. Then they had the good judgment to seek help with their new found opportunity from the Florida SBDC at Seminole State College (FSBDC at SSC), a sub-center of the FSBDC at the University of Central Florida. 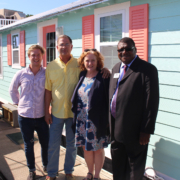 The Billings are owners of Floating Bungalows LLC in Sanford, Florida, a manufacturer of luxurious, attractive and ground-breaking floating homes at the cutting edge of the Tiny House Movement. Their homes were recently featured on HGTV’s Tiny House Hunters television show. Built on a thermal plastic hull, these approximately 500 sq. ft. fully-appointed floating homes are technologically advanced, handcrafted using only the finest components and materials, and held to exacting standards. The result? A luxury home on the water built for simplifying life with hardwood floors, granite counter tops, full size kitchens and bathrooms, not to mention the porch at the water’s edge. Some say it’s better than a boat and needs less maintenance. And grow the company has. In 2017, after deciding to go into business for themselves, the Billings sought assistance from the FSBDC. They started slowly with one person working half time, built one bungalow outdoors and earned revenues of just over $200,000. As of 2018, they have grown to three full time employees, moved into a 6000 sq. ft. manufacturing facility, built two bungalows and more than doubled revenues to over $500,000. Looking ahead in 2019, the company is currently building its 4th Floating Bungalow with the 5th set to begin production February 2019, and positioned to build 6 – 8 bungalows annually. It’s that kind of success that has earned Floating Bungalows recognition as the FSBDC at SSC’s 2108 Seminole Success Story of the Year. For information about Floating Bungalows, please visit www.floatingbungalows.com .